When Bertha Moore’s husband, Harold, passed away at the young age of 32, she was left to raise their four children on her home. Not only did she provide a loving, Christian home for her children, but she also became a mother figure to all the kids in their Valley, Alabama, neighborhood. Bertha is now 86 years old and has embraced generations of children in the neighborhood, welcoming them into the home where she has lived for the past 61 years. Soon, she will be welcoming everyone to a new Fuller Center home volunteers will help her family build during the Millard Fuller Legacy Build in September. It’s still common for neighborhood children to drop by the home to visit Granny. But the home is literally falling apart. The floors are sinking. The roof leaks. Major electrical problems have rendered the home unsafe, as well. Shysters have taken Granny’s money only to perform shoddy work or to abscond without providing any services at all. Even so, Granny had to be talked into becoming a Fuller Center homeowner partner. 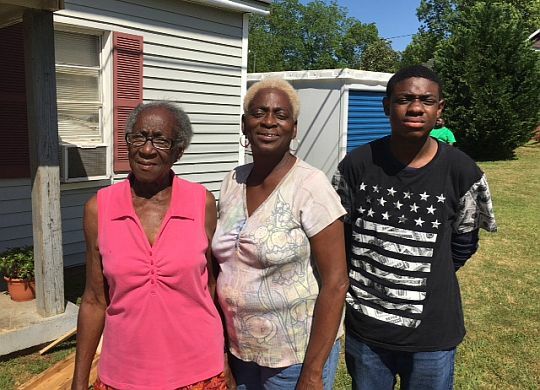 Granny’s new home will be among three new homes constructed by dozens of Fuller Center volunteers during the September 18-23 Millard Fuller Legacy Build, which also will include one major rehab project. The build is an annual event in memory of Fuller Center for Housing founder Millard Fuller — the Presidential Medal of Freedom recipient who was raised in Lanett, Alabama, a community adjacent to Valley. It warms my heart to see that there is still kindness in a world That has become so cold and uncaring. What a wonderful thing to help mrs Moore out. She has a good heart. What a blessing for Granny! Serving the Lord does pay off. What an blessing for Granny! Serving the Lord will pay off! What a blessing and she really deserves this new home, and great those that took the step to help initiate to seek her a comfortable place for her to live, and that’s a good program.